A Halloween Prop Batman Would Perch On! Hello all! For the month of October,I’m posting about a special project I just finished up. Every year I’m commissioned to create a Halloween prop for a local business, Fire and Safety Equipment Company, located in Concord, VA. The company sets up Halloween decorations for their annual event, and this year they wanted something a bit more unusual. 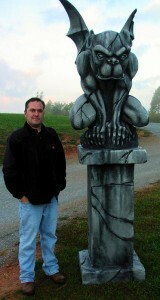 I’ve just put the final touches on my first life size gargoyle! Originally I designed it to go on the roof of the business but after showing it to the owners, they decided it would make a great Photo Op and asked me to make a pedestal for it to go on. This piece measures around 9 ft tall when its put together! I made the gargoyle from Styrofoam and applied a hard shell coating to protect it. I then used a paint technique to give it that old weathered and creepy look! Really like this one – especially at this time of year! 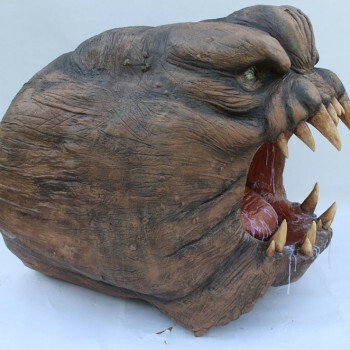 Very nice looking – I’d like to make something like this (much smaller) for my yard for Halloween. Great job!